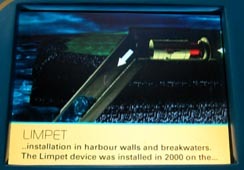 > LIMPET is designed for intallation in harbour walls and breakwaters. > It makes use of air trapped in a reinforced-concrete chamber. 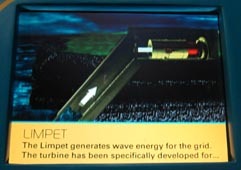 > As waves hit the chamber the trapped air is forced through a turbine to generate electricity. > To capture energy from ocean waves you must put something in the path of the waves that takes out some of that energy. > Wave energy devices often need to be very large if they are to work well. 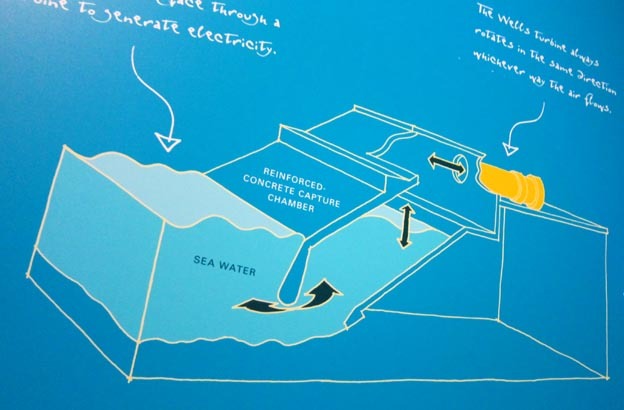 > Most wave energy experiments have been carried out using small-scale models in tanks. > The Wells turbine always rotates in the same direction whichever way the air flows. > It is ideal for use in fixed wave power devices such as LIMPET where air moves backwards and forwards as the waves rise and fall. 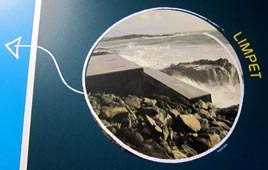 > The rise and fall of the waves forces air trapped in the reinforced-concrete chamber set into the rock face through a turbine to generate electricity. 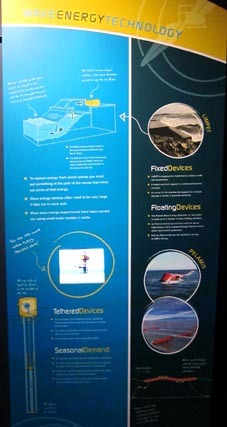 > Wavegen developed and operates Limpet, the world's first commercial-scale wave energy device. ...island of Islay in Scotland. 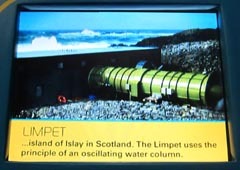 The Limpet uses the principle of an oscillating water column.